The bank has since apologized for the ad in a Facebook post which read,"We apologize that the Ads have been very insensitive. The posts have since been removed and we have taken steps to resolve the matter internally." We apologize that the Ads have been very insensitive. The posts have since been removed and we have taken steps to resolve the matter internally. Predictably, and with good reason, social media outrage filled Facebook comments including mocking the brands automated bot which responded to every tweet with, "Thanks for your feedback." 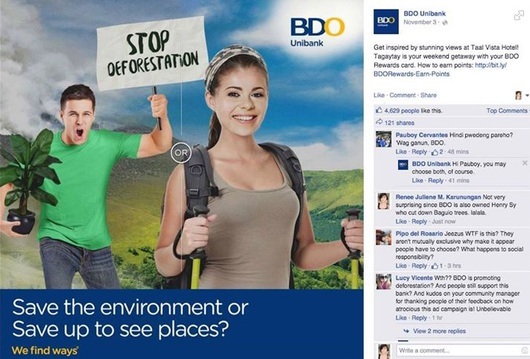 The ad has been pulled by the bank but not before screenshots were taken preserving the idiocy for time immemorial. Environmental advocate Renee Karunungan snagged a screenshot and pointed out the bank's owner, Henry Sy, owns a firm that cut down trees to build a parking lot and erected a building which caused massive flooding during a typhoon because they blocked waterways.